Not to be confused with the Oscar Meyer Weinermobile, this vehicle cruises America taking photos for Google Maps street level view. My friend Peter Sachs (who originally installed the software for this blog–five years ago) was driving westbound on I-95 near the Q-Bridge yesterday when he saw an odd looking vehicle. Since Peter spies for a living he had no choice but to speed up to get a better look. It was the Googlemobile! Not to be confused with the Oscar Mayer Weinermobile, this vehicle cruises America taking photos for Google Maps street level view. Unfortunately, I can’t embed a map with the street view turned on, but it looks like Google has been shooting and posting street view photos from much of the Hartford area and north. Memo to Sergey and Larry: Is this how you want people to think of Google–as a company that sends out guys driving underpowered, bland Chevys? The fun part will be going through the images frame-by-frame trying to see if Google was shooting Peter while Peter was shooting Google. That will be fun, right? 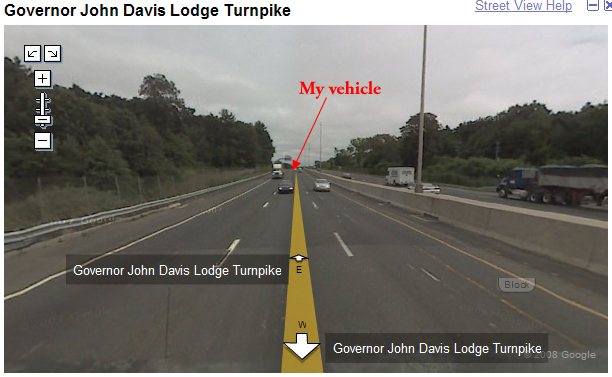 Blogger’s addendum: Peter has sent me the photo of his car taken from the Googlemobile. It’s not Earth shattering, but in the interest of completeness it’s posted here.